Background: Gastrointestinal stromal tumor (GIST) is a rare tumor of the small bowel, which can be difficult to diagnose and has a varied clinical outcome. Purpose: This is a retrospective review of the diagnosis, management, and clinical outcome of 32 patients diagnosed with primary small bowel GIST from a single center and a comparison of the findings with previously published cases. Patients and methods: Retrospective review of data from patient clinical records, endoscopic and imaging findings, surgical procedures, tumor histology and immunohistochemistry, and clinical outcome was conducted. Results: Data of 32 patients with a median age of 56 years including 50% men and women were reviewed. The majority (29/32) were symptomatic at presentation, with the main symptom being gastrointestinal bleeding (15/32). Imaging detection rates included ultrasound (0%), magnetic resonance imaging (0%), computed tomography (54.8%), computed tomography angiography (71.4%), and double-balloon enteroscopy (88.9%). The mean tumor diameter was 5.3 cm; 4 tumors were located in the duodenum, 21 in the jejunum, and 7 in the ileum. Based on the tumor size and mitotic index, 5 (15.6%), 15 (46.9%), 0 (0%), and 12 (37.5%) patients were classified into very low-risk, low-risk, intermediate-risk, and high-risk groups. Immunohistochemistry showed positive expression for CD117 (100%), CD34 (81.2%), DOG1 (93.8%), smooth muscle actin (37.5%), S100 (9.4%), and desmin (6.2%). Twenty-five patients (78.1%) were treated with open surgical tumor resection; seven patients (21.9%) underwent laparoscopic surgery. Postoperative complications that occurred in seven patients (21.9%) were resolved with conservative management. Four patients were treated with postoperative imatinib. At median follow-up of 30 months, two patients were died. 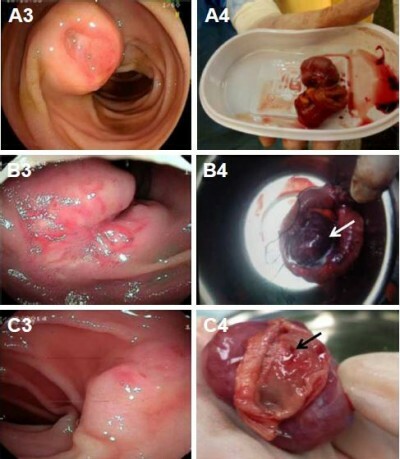 Conclusion: The findings from this case series, combined with the findings from previously published cases, provide an update on the current status of the diagnosis and the therapeutic approaches that might lead to improvement in prognosis for patients who present with primary small bowel GIST.